Things have finally slowed down enough to post a blog. The first week back to work was a busy one, at least in terms of evening activities. 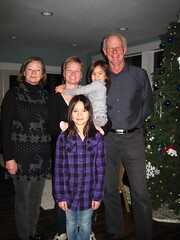 We were able to see Calvin off to Japan for six months and spend an evening with Jenny and Ada. On New Years Day we went to Esther's cousin Anna's house in Tacoma. Her parents were there from Norway as well as Esther's brothers and families. It was great to see niece Bria back from England. Anna and her husband Sovann have a wonderful classic home in North Tacoma overlooking Commencement Bay. They recently raised it up to put a garage underneath and add a huge great room that soaks in the view. We were treated to a Norwegian tradition of lamb and cabbage, along with some scandinavian desserts- a great way to start the New Year.